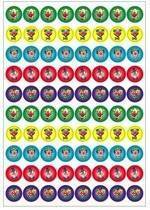 Use brightly coloured Halloween Ghosts Merit stickers for student reward and encouragement or for decoration. Pack of 96 stickers. Size 29mm diameter.